Budget 2017 has proposed many new amendments in income tax rules for charitable trusts and their income tax policies. For start, previously charitable trusts accepting properties or money donated by any person without consideration was non-taxable under section 56(2). Now, a new clause (x) has been added to it which prescribes that if any donation above INR 50,000 been accepted by any trust then that is taxable and they have to file income tax against it. Such amount must be mentioned under the “Income from other sources” head while filing ITR by the taxpayer. Although few exceptions have been included under this section for certain transfers of properties to a charitable/private trust. Calculate Income Tax Liability on Income from House Property. Also, any trust seeks to change their object cause will require to registering again with the same under the new income tax rules amendments. Previously, fresh registration was not mandatory for changing object clause. The registration will need to be done by making a fresh application within thirty days period of such clause modification. Further, if ant charitable trust gives away any donation to another trust with a direction specific corpus than such donation will not be considered as an application of income and need to file income tax with mentioning it. This amendment is introduced under section 11 (a) & (b) which was not added into it previously. 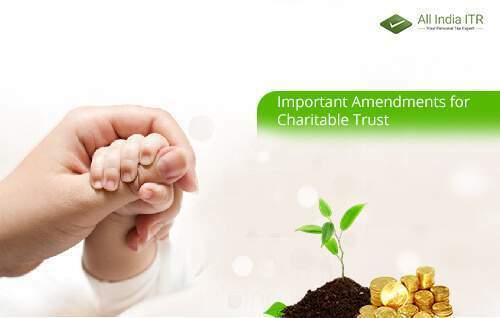 Now let’s take a look at the section 12AA under which many charitable trusts are registered and they are now liable to file income tax if the maximum amount exceeds the minimum taxable amount as The Income Tax Slab Changes Announced in Union Budget 2017. This is mentioned in sub-section (4A) of section 139 which will directly affect the sections 11 and 12 of income tax act. However, the time schedule for such tax filing deadline has not been mentioned yet in this new income tax rules amendments under section 139. In such case, it is being assumed that the charitable trusts will have to file the income tax return by the time period mentioned under section 139 of the income tax act. The Indian government is getting more conscious with collecting the correct tax from sources so that our economy gets more strong and to fulfil this goal, new amendments are being proposed in this budget 2017. All the new amendments and income tax rules proposed for the charitable trusts and their income tax policy will be affected from the financial year 2017-18.
excellent piece of information.The overall look of your web site is magnificent, as well as the content! .It is the clearest i have found and i am sure it is going to help me a lot . And i had found it to be interesting one.great work for those hands who work behind this.